The percentage of people under age 30 who own their own private business has reached a 24-year low: About 3.6% of households headed by adults younger than 30 owned stakes in private companies (Wall Street Journal, January 3-4, 2015). That is WAY down from 10.6% in 1989, and 6.1% in 2010. In 2013, the proportion of young adults who start a business each month dropped to its lowest level in at least 17 years (Ewing Marion Kauffman Foundation). The U.S. “startup rate”–new firms as a percentage of all firms–fell by almost half between 1978 and 2011 (Brookings Institution). What about all those news stories about young 20-somethings who just became multi-millionaires in the latest IPO? It turns out they are pretty rare exceptions. For a country to have a vibrant, innovative economy, you need lots more innovation, not just of the famous tech millionaire variety. In the U.S., we’re seeing an unusually strong job market, and high salaries, in established technology companies. So why take the risk, when you’ve got several strong job offers at successful companies, with good pay and benefits? We need startups not only for employment, but also for ideas. It’s part of the vitality of this country to have people starting new businesses and trying new things. What do you think we should do to foster more entrepreneurship in our young adults? 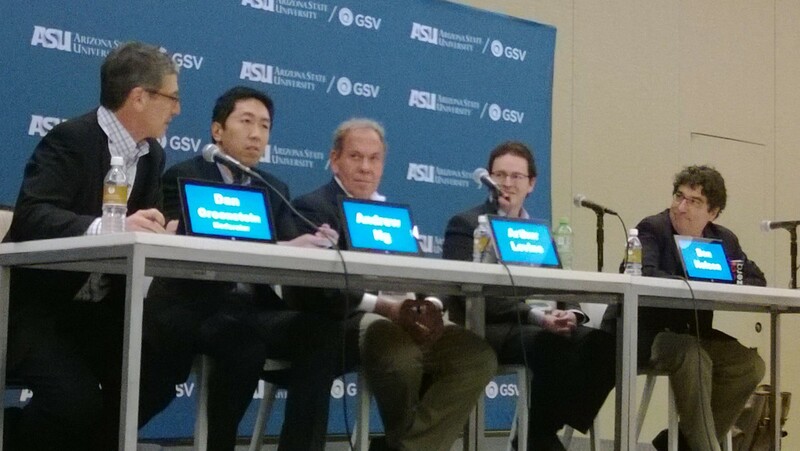 I’ve spent the last two days here in Scottsdale, Arizona, at the fifth annual ASU GSV summit, which likes to call itself “Davos in the Desert.” It brings together ed tech entrepreneurs looking for funding, and venture capitalists looking for the next new thing. Quite often, they meet and do deals. Based on my experience here, I would say the organizers have accomplished their goal of “bringing together the world’s most visionary, passionate, and energetic players in the education innovation space”. I’m a bit fuzzier on their mission statement, which is “to become the fulcrum of activity and influence on the current and future states of global education. We’re creating a platform for advancement.” That’s a bit too mission-speak to mean much. So what really happens here in Scottsdale? What I saw was a lot of very serious people primarily interested in making money. They are all super-smart, connected, and knowledgeable. Michael Lewis would call them “the smartest guys in the room.” Five years ago the event began as an investor gathering with about 40 venture capitalists. The GSV in the title refers to Global Silicon Valley Advisors, a VC firm playing in the education space. In subsequent years, entrepreneurs followed the money and started to come here to pitch their new venture ideas. Since taking my new professorship in educational innovation at UNC Chapel Hill in August 2013, I’ve seen a lot of ed tech startups and nonprofits, and I can attest that the organizations pitching here are working at the very highest level. They know their target market, they can tell you their value proposition in their sleep, their founders are connected and experienced. I have no doubt that millions of dollars of deals took place in the last two days. It is wonderful to be surrounded by people who share my mission: to improve education and learning. But. As a learning scientist–an expert in the science of how people learn–I was disappointed at how little of what I saw here is grounded in the science of learning. I only saw one presentation that made any reference to this forty-year body of research–by Professor Jim Stigler of UCLA (who has done very important research, and also founded multiple ed tech startups, and worked for Pearson for 4 years during a leave of absence from UCLA). At the many reception events, when I described my own mission at UNC Chapel Hill–to create new programs that will help educational innovators understand how to ground their ideas in the science of learning–a few people got it right away, but many people seemed confused about why they would need to know anything about the science of learning. And these are really smart people. So I’m trying to figure this out: Why wouldn’t educational innovators want to ground their ventures in the science of learning? Why wouldn’t venture capitalists want to be assured that what they’re funding is based on solid science? Here’s my tentative answer, and I’d be interested to hear what you think in the comments on this post. First: Everyone here is in a big hurry. They want to be first to market, they want to get to Series A, B, and C funding, they want their exit strategy (e.g. selling out to a big corporation like Pearson) to repay their investors. The problem with learning sciences research is that we know it takes time, two to three years minimum, to develop an innovation that works. The entrepreneurs and investors here don’t want to hear that. Second: People here think we don’t need research, because they think markets will naturally work towards the optimal solution. Their belief in markets is so strong that they think markets essentially remove the need for scientific education research. Of course, no one would make this argument when it comes to medical innovations. You don’t start selling a bunch of new heart valves, and then wait to see which people die and which people live, to figure out which heart valve works best. We have a body of research, and a community of researchers, who can tell you that BEFORE you put the heart valve on the market. The analogy with learning sciences research is fairly direct: We have a large body of scientific knowledge that can guide the development of more effective educational innovations. So why wouldn’t you want to know about that BEFORE you go and design an ineffective app or curriculum? Third: Learning sciences researchers largely stay inside the Ivory Tower, and do academic research. They generally don’t know how to commercialize their innovations, and the incentive systems at universities don’t reward that anyway. They don’t have backgrounds in business and they don’t have the skills to create entrepreneurial ventures. There are exceptions, of course, but overall the learning sciences community hasn’t done an effective job of making the case for the value and relevance of this research. Fourth: People in the finance and technology space generally think they are smarter than people who work in education. I can say this because I used to be one of them: My undergrad degree is in computer science, and I worked in two high-tech startups back in the 1980s. We always referred to squishy social scientists as making “hand wavy” arguments (that’s pejorative and means “arguments full of holes with no scientific backing”). But after editing two editions of the Cambridge Handbook of the Learning Sciences, I can attest that this body of research is solid and rigorous and has powerful implications for how to design educational innovations. Smart people generally are good at paying attention to solid scientific evidence, but I think there’s a cultural blindness among the finance and technology people here that makes them tend to discount education research. The good news is that lots of people get it right away. Among them are my colleagues, working at several top universities, who are also creating programs for educational leaders, including at Johns Hopkins, University of Pennsylvania, and University of Southern California. And of course, there’s my own new MA program at UNC in educational innovation, technology, and entrepreneurship. I’m confident we’ll get there eventually, to a cross-fertilization of learning sciences research with the innovative energy of the entrepreneurship and VC community. Then we’ll move more quickly toward the goal we all share: to improve education for everyone. Entrepreneurs have skills that are very much like those of con men. To raise money to start a business, you’ve got to sell an imagined future–a dream. Successful entrepreneurship involves hucksterism; like a con artist, you’re peddling optimism. Job’s endless rehearsals for his public presentations and his scripting of every moment for maximum effect–these are all straight from the con artist’s playbook. So, too, is the sense of conviction he projected. Of course, con artists know that the fantasies they’re selling are lies, whereas entrepreneurs really believe in them. And in many cases, entrepreneurs actually deliver, and investors make money. Still, it’s a fascinating article, and it shows why Surowiecki is still doing the New Yorker weekly column after many years–because he’s an insightful and brilliant writer. *Surowiecki, January 13, 2014. “The Financial Page: Do the Hustle”. The New Yorker, Page 21. How to Foster Entrepreneurship in China? The current education system does not produce people who are innovative. That makes it harder for the country to reach its long-term goal of building an innovative society. The government in Beijing knows that entrepreneurship has driven the Chinese economy, and they now have policies in place–for example, to bring back Chinese professionals who attended university in other countries and stayed there. One policy offers a bonus of as much as $160,000 for those who return; and yet, since 2008, only 3,300 professionals have taken up the offer. Some of China’s top universities are beginning to offer entrepreneurship education programs, of the sort that are now common in the U.S. thanks in part to the funding of the Kauffman Foundation, which has famously sponsored many “Kauffman campuses” where students can major in entrepreneurship and participant in business plan competitions, under the guidance of experienced local mentors. (My employer, Washington University, is a Kauffman campus.) Three of China’s most elite universities, Tsinghua and Peking Universities in Beijing, and Fudan University in Shanghai, have created incubator programs to help entrepreneurs develop commercial applications. So what’s the solution for entrepreneurship in China? Schools and universities are an important part of the solution; many Chinese perceive their own schools and colleges to be focused on rote learning and not receptive to creativity and critical thinking. One international business student chose to attend an English language university, run by Britain’s Nottingham University, specifically to acquire the “critical thinking” that her uncle says is lacking in Chinese graduates. But colleges can’t solve the problem alone. Cultural attitudes need to change to value entrepreneurs. Venture capital is an essential component, and a business climate of open and fair market competition. Many would-be entrepreneurs give up after they realize the bribes they’re expected to pay, and the unfair advantages given to large state-owned enterprises (SOEs). The path to greater Chinese innovation is complex, but education is one of the core components of greater creativity and entrepreneurship. *Bob Davis, 2013. “Chinese college graduates play it safe and lose out.” WSJ, Page A1, A10.